The Wilborn Family: Trying to figure out this blog thing! Trying to figure out this blog thing! So, I am trying to figure out how everyone makes their blogs look so darn cute. Seriously....found thecutestblogontheblock.com, but the I finding out that apparently the layout matters...Anyway, I should be working either on my thesis or on the office, but am at the moment, obsessed with getting this block at least semi close to everyone elses. I am SUCH a newbie! This weekend was awesome. We got to celebrate my Dad's 58th birthday in Montogomery on Saturday. It was such a treat to be able to have our family together. Everyone is so busy these days that it is a feat to try and get everyone together. I sometimes secretely wish that I would know what it was like to live in the "olden" days when everyone wasnt so busy. You know what I mean? Maybe like in the 50's? I am in constant struggle with myself trying to decide if I am doing what is best for my family. Yes, I love what I do, but is it at the expense of my family? I pray about this daily and am hoping for a revelation soon. I miss my girls during the day! One of my friends stated a couple of months ago how she is "trying to slow down and enjoy the moment". I am trying to live by that...I really do want to sit back, relax, and enjoy where I am in my life now. I cant help but stress about the future...Maybe this is a life lesson for me? I am obviously just rambling..but these are the thoughts in my head. I have decided to use this blog sort of as my "journal" if you will. So, if you are bored at this point, just stop reading. :) I am surrounded by a bunch of men in my residency, so in a way, this is how I am going to vent! Ahaha! 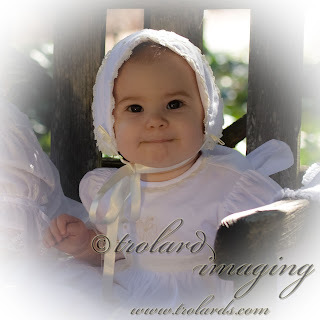 Back to the weekend....sweet Baylor was baptized Sunday! It was a very blessed day and a wonderful celebration. Baylor did awesome! She sat through the entire service...yes, even the sermon! She even held the priest's hand during the baptism....I almost cried. She is quite possibly the SWEETEST baby in the world. Ansely did awesome as well. She also sat through the service and stood at the baptismal font like a big girl. I am amazed at how she has turned into a little girl, it seems, overnight! I am so thankful for Baylor's godparents. They are awesome and are my inspiration to be a better Christian. I know that they will be wonderful Godparents to Baylor. Well, just received an annoying email from my chairman about my thesis...must go and make amends. Until later...toodles. Gorgeous picture of Baylor and yay for Ansley and her potty! trying to slow down and enjoy the moment! Poo goes in the POTTY! !